GOLDEN ROSE: Wow Blessed be Holy Face!!! I see myself as a small child sitting on Our Lord’s Lap. Our Lord is pointing outward through a window across a deep valley, to a lighted city atop a hill – the Holy City of Jerusalem, anew. In front of the City is a tall gate with Angels adorning the top – one on each side. Beyond the gate is a great arena in the middle of the city. At this time, I see the arena filling up, as people are gathering from all directions to enter the arena. Although the entire city is filled with a natural light, a special glow is emanating from within the arena itself. At this time, our Lord leads me by the hand into the arena, where He lifts me up into the stands and I am handed to some family and friends, where they are seated. Our Lord then continues on to the main section of the arena, where Our Lady and St. Joseph are already seated. The Holy Ghost in the form of a Dove hovers above them. The Eternal Father is above them all looking down over all in the entire arena. His Presence is both massive and awesome. Our Lady and Our Lord are dressed in royal robes, both with Crown and Scepter – St. Joseph, as well. They are all seated on beautiful gold Thrones, which are ornately decorated. The Holy Ghost also wears a little Crown. Suddenly, the Dove turns into the figure of a young Man, also wearing royal robes, Crown and Scepter. He takes His place on a Throne with the Holy Family. There is another Throne beside the Holy Family. The Little Pebble, is seated on a Throne, dressed in Papal garments as the Vicar of Christ, during this time. In the middle of the arena, a very large Image of the Holy Face of Our Lord emerges. This is the Image as in the Holy Shroud of Turin. This Image is not solid – it is similar to a hologram. It is as if you can see through it but not touch it. You can see the Agony on Our Lord’s Face – which is a living Image, made of a Heavenly light; a Heavenly glow. This Image is full of life – It is living and breathing. In an orderly manner, all come forward to worship and adore this Sacred Living Image of Our Lord’s Holy Face, (including the Little Pebble, St. Joseph and Our Lady). GOLDEN ROSE: I now see Our Lady holding a baby with dark curly hair. This baby is me. She gives the baby a pacifier and holds her up, standing on Her lap, facing Her. Our Lady then leans the baby against Her shoulder while rubbing her back and head. She then changes the baby and places her back leaning against Her shoulder. (after my death, Our Lady will be getting me – and others – ready for whatever role we have in the Reign of Peace . I believe this message relates to that). GOLDEN ROSE: This is a Message from Our Lord a few days after the Vision Message was received. Our Lord also told me to give this to Bishop Peter, to give to William and that he is to discern this and then give further instructions. I am also to show this to my Spiritual Director, Fr Charbel. There was another similar vision I gave to William some time ago. So the Vision I have had many times – it seemed more personal and like it was about Heaven and about when I get there. The following Message is new. These visions have never been connected to a Message like this before. However, last week I was told by Our Lord, that on Holy week I would receive a very important Message regarding my Mission. I take it this is it. GOLDEN ROSE: While praying, I received my Sign and Our Lord Appeared at the front of the room. This is a past message that was sent to the Little Pebble some time ago. I brought it out because it is similar. GOLDEN ROSE: (Vision) I see a beautiful city – very shiny and clean. In the middle of the city is a large arena. Inside, Our Lord and Our Lady are sitting at one end along with St. Joseph and the Holy Ghost, in the form of a Dove, hovering above them. A large crowd had gathered there. The entire crowd is now applauding. The Little Pebble rides in on a horse with his sword held high. He turns his horse to stop. Suddenly something is thrown down from the stands. He catches it in one hand like a football, as his horse rears back. He picks up the package and opens it – inside is a beautiful gold Crown with many gems on it. He places it on his head as the crowd stands and cheers. They are cheering, because the Dragon has been cast from the face of the Earth. St. Michael has now appeared on a horse, with his sword held high in the air. A large Heavenly Army is all around. I see an arena in the Heavenly City. This is as if it was continued from the earlier version, with the same participants. There is a Dragon in the middle of the arena. St. Michael takes his sword and plunges it through the Dragon – it falls and dies and melts into small puddle of black slime. St. Michael and the Little Pebble take a “Victory Lap” around the arena, as all cheer. There has appeared in the arena a vast Heavenly Army – it is larger than the arena, however they miraculously all fit. They are not all on the ground but on many different levels – like in the air. 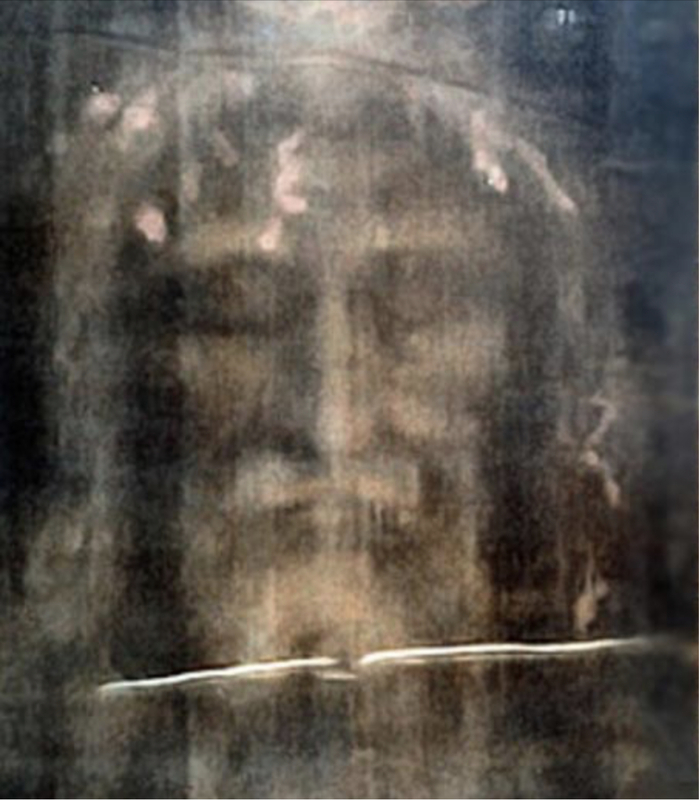 Suddenly a large Image of Our Lord’s Holy Face – as in the Shroud of Turin – has appeared. The Image is alive and both the front and back can be seen. All present get down on their knees to pray and give thanks. All are in awe. There is a great Light streaming forth from this Holy Image. All there form a line and come down to approach, adore and kiss Our Lord’s Holy Face. (I see myself there and I take my turn. The Little Pebble, St. Michael and Our Lady also take their turns. This is a truly awesome experience! Afterwards, the Image fades and Our Lord appears as a King and Our Lady stands beside Him, with the Holy Ghost overhead.